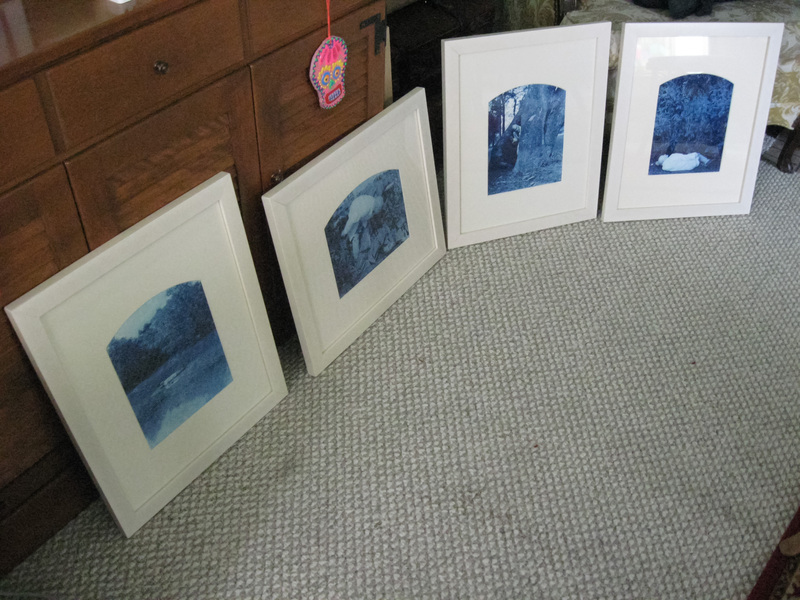 Here are the four Dr. Frangst cyanotypes going to Bowling Green for Fresh: Ohio. Maybe there will be a return of the return of Dr. Frangst. The series has spent enough time in storage and the 8×10 Burke and James camera needs a workout. Pink ceramic skull gift of Konsuela (Konni Carpenter). Correction: The pink skull was actually made by Kristi Bogle (sister of Konsuela). The two month residency in Boston is now in the rear view mirror and I am swamped with obligations that took a back seat to a very productive summer. I still hope to summarize the residency in an entry here before too many of the details are lost. Wild Kingdom at Texas State University San Marcos School of Art and Design’s Gallery I from August 24th through September 2nd. Four cyanotypes from the close-up world of dr. frangst. Fresh: Ohio at Bowling Green State University’s Willard Wankelmann Gallery from September 9th through October 7th. Three of the large scale Vandyke brown prints from from walking and four cyanotypes from the Return of Dr. Frangst. ArtPrize 2011 at the Arts Council of Greater Grand Rapids gallery, 38 West Fulton from Septmeber 21st through October 9th. Selections from from walking. Sinclair Community College Faculty Show from September 6th – October 6th with an opening reception on September 15th. 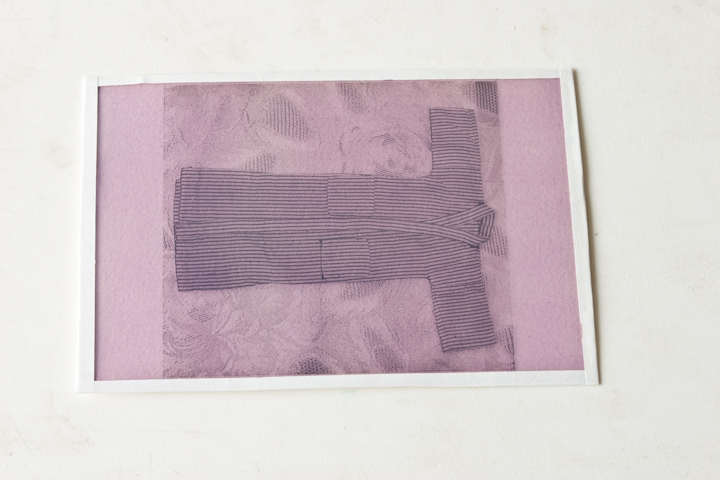 One anthotype Rose Red Pajama Pants made during the summer residency in Boston. Please visit Sinclair Community College’s Gallery website for more information. During the summer residency, I was able to work with Emmanuel College’s Nick Pizzolato which resulted in three video shorts. Please visit http://www.vimeo.com/27244003, http://www.vimeo.com/27243664 and http://www.vimeo.com/27243001 to listen to me talk about vandyke brown prints, polaroids, and anthotypes. Emmanuel College | Artist in Residence | Frank Schanberger from Emmanuel College on Vimeo. Here is pants party number #2 which is an interesting creature. Part failure. Part discovery. The yellow flowers I chose, Rudbeckia Hirta, surprised me. I had expected an image of a pair of pants in the bright yellow color of the flowers on a light ground. 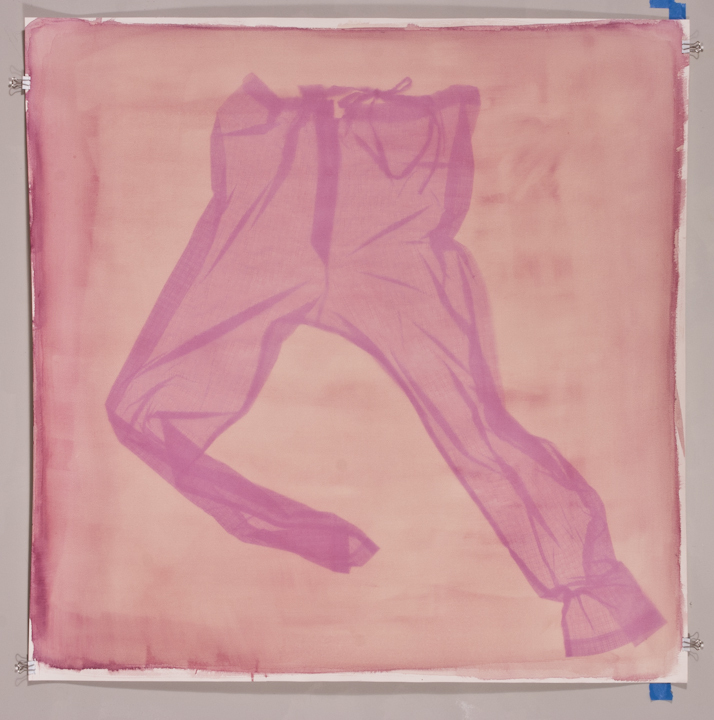 I got an image of pink pants with light folds and a medium density ground.The pigment faded to some degree and also changed color. There is also evidence of a negative image which is visible in the folds of the pajama pants and the less layered areas of the garment. The three areas of density are: the folds which are the least dense. The midtones which are mostly the bleached-away ground and the darkest areas which are the least layered areas of the pajama pants. See the detail image below. Last night I did a bit of art documentation including a painting by Bridgette and lots of the anthotypes from the residency. 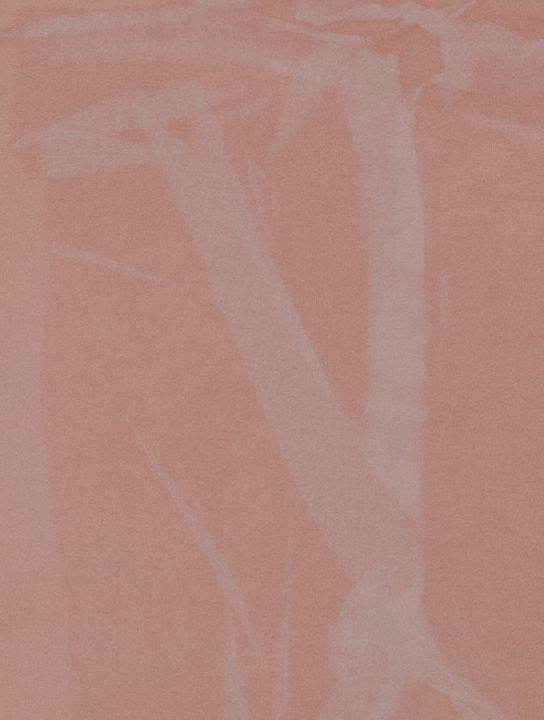 Here is one of the more successful pants anthotypes made using rose petal emulsion on Arches Cover. The exposure was about 13 days (it came down on August 17th, a day before I left Boston). Male art (I used ken doll bathrobe) or, more accurately, mail art is a fitting end to the residency. 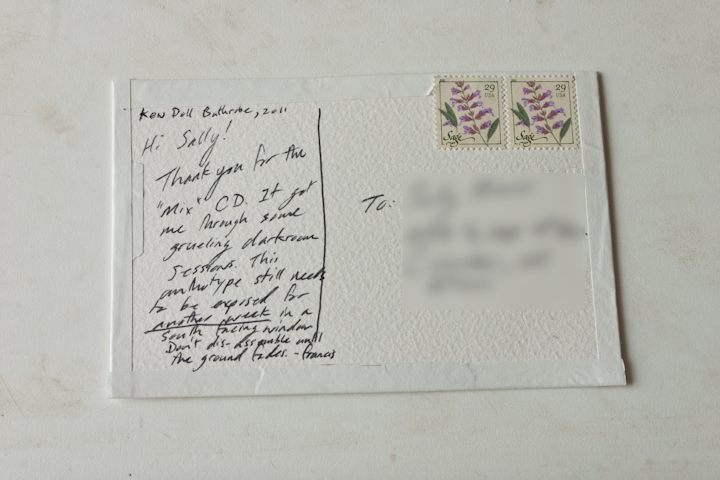 As part of an exchange with friends left back mostly in Ohio, I promised handmade postcards if they put together a mixed CD of what they were listening to. I got beautiful compilations from Dayton, Columbus and Baltimore which went a long way to making the tedious task of grinding plant pigments or meticulously washing Vandyke Brown prints more pleasant. I was at a loss for ideas. What should I send my DJ’s back in return for their contribution. Initially the postcards were going to be small Vandyke Brown prints, then it became anthotypes, and then I just ran out of time and good sunny days with which to expose. Artists don’t solve problems, they make them and sometimes, if they are lucky, they get someone else to solve the problem. 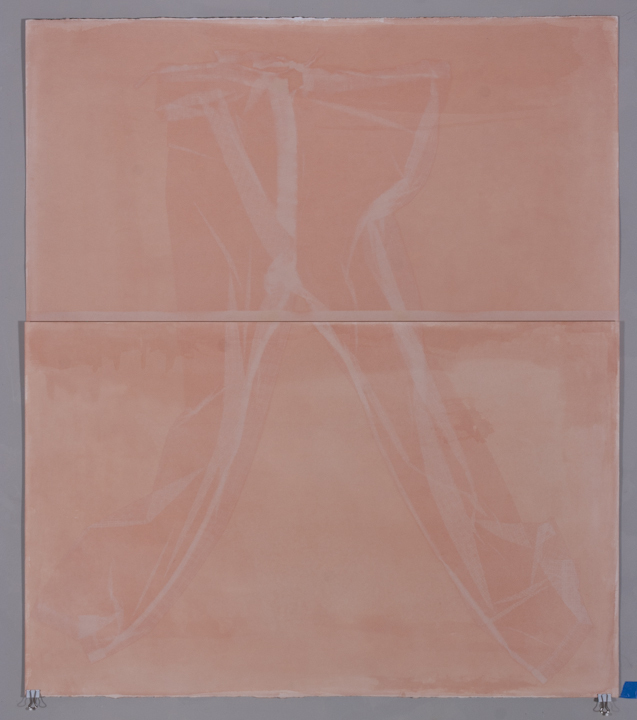 I sent my three collaborators a rose petal emulsion coated piece of Arches Cover covered by taped on transparency of an image appropriated from an Ebay auction. The image is a Ken doll bathrobe (in keeping with my somnambulist theme). The mail art cards are a work in progress to be completed by the three recipients. They all need a little bit more exposure before the transparency is separated from the anthotype coated paper. Maybe another week in a sunlit window. Perhaps one or more of the three recipients will elect to not put the anthos in the window and not separate the transparency from the paper. They could be done, after all isn’t completion is in the eyes of the receiver? Tonight, I came across a promotional video for last January’s exhibition of portrait work curated by Kay Koeninger, Here’s Looking at You: Portraits in Ohio, at the Riffe Gallery. Go to http://www.youtube.com/watch?v=VZqIdWlFElU to see it. Once the website for the Ohio Channel uploads Dan Shellenbarger’s interviews of the artists, I will post a link here.